Three men have been sentenced for assault and robbery of a shop in Edinburgh. West Granton Community Store was robbed on 2 December 2016. 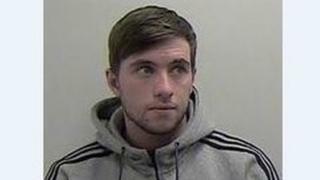 Craig Vallance, 24, from Edinburgh, was found guilty and sentenced to 54 months in prison. Daryl Loftus, 24, from Edinburgh, pleaded guilty and was sentenced to 47 months. Darren Harvey, 23, from Edinburgh, pleaded guilty and was sentenced to 35 months. They were sentenced at Edinburgh Sheriff Court. Det Sgt Robert Wallace, of Police Scotland, said: "Vallance, Loftus and Harvey showed absolutely no regard for the welfare of the staff members during this robbery. "I would like to thank all the witnesses that were involved in bringing these men to justice. "We treat all crimes of this nature with the utmost seriousness and are committed to using all resources at our disposal to investigate and bring perpetrators before the courts."